I've only just finished my dinner, I had such a nice home made cheese and spinach lasagne. Since we had our baby, my boyfriend and I have hardly cooked, so today it was nice to cook a proper meal even though we were exhausted! Today I have the HITS Phenomena polish to show you as promised. I picked Afterglow as my first to post because it's the one I was most excited about, and it certainly didn't disappoint! 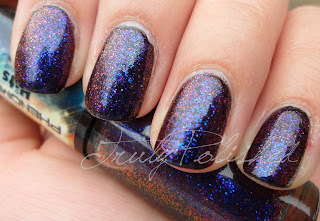 Afterglow is a multichrome glitter top coat that shifts from blue to purple to red. I layered this over black and I really don't think you could get this to full opacity on its own. The photos below all show three coats of Afterglow over Black Polish by Gold by Giles. I took all the photos in natural daylight. No sun today unfortunately, what a surprise! I absolutely adore this polish. This collection has been the one I've been most excited about. I love HITS and this is unlike anything else I've seen. 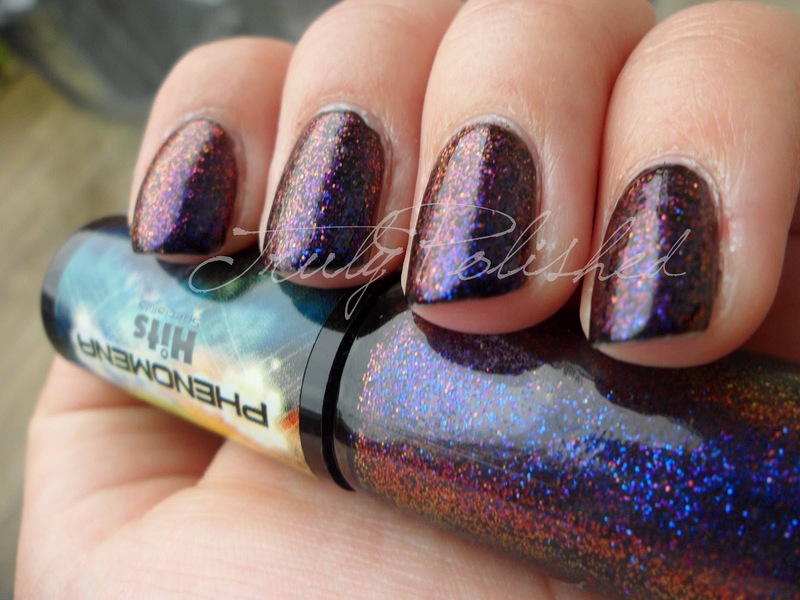 It's different from other multichromes because the colour shift is in the glitter not the polish. Sometimes it even has a 3D effect which is really pretty to look at! I bought this polish (and the other 9 I bought with it) directly from Speciallita here but they do sell them at Llarowe too.